A great reward, students love these lightweight drawstring "backpacks" that let them show their math spirit in style. 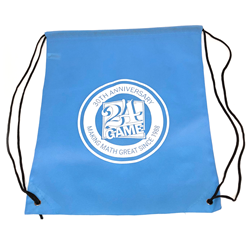 Limited Edition 24® Game 30th Anniversary bag carries books, clothes, etc. 12" x 16''. Features 24® Game logo. Currently available in Carolina Blue or Navy Blue - let us choose. $4.95 each. Printed in USA.